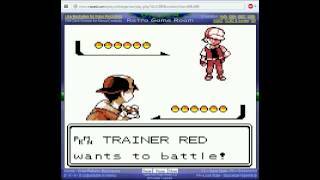 Play Pokemon Crystal online with Game Boy Color browser emulation for free! Pokemon Crystal (GBC) game rom is loaded with features in our flash, java and rgr plugin emulators. Nothing to configure, we've done it for you! OMG I FOUND A SHINY KOFFING!!! After only one Poison Sting? Really? I thought 1hp was worth uploading. TASTE THAT YOU SICK COW, YOU!!!! ALL I DID WAS THROW ONE ONE! OMG :O A PINK PHANPY!!!!!! Oh yeah, it's a shiny. how will win a crocodile or a bird? OMG I FOUND A PHANPHY! *GASP* YOUR NOT REALLY A REDHEAD! How is it level 9? Favorite Gym Leader right here! *Insert Chuggaa scream* I also had his team! Our Lord Helix has reached his final form! OH MY GOD!!!! ANOTHER SHINY!!!!! She isn't a gym leader. Not in this game. I found him! But he is a pain to catch! I DID NOT MEAN FOR THIS TO HAPPEN! I beat the elite 4! woot! I beat the game! What to do now? Shiny, Female, and Pika all won! Red Lapras Vs Red Gyarados! Shiny Hitmonchan Vs Non-Shiny Hitmonchan! Bad shot, just ignore it. My team after the champion. Half way there,now what city is gym 5 in? PIKA IS STILL A PICHU! Now i feel like ash! I totally wasn't expecting this! Finally evolved after level 48! OMG, YAY! Just what I needed! Did my game have a seizure?! Finally,Umbreon took forever to get!!!! awwww yea shiny pichu from that weird egg!!! Thanks Jayden using Poison sting on Crocnaw! After 4 load states I FINALLY got Pichu! Travel back to the world of Johto as the Gold & Silver series continues with brand-new features! 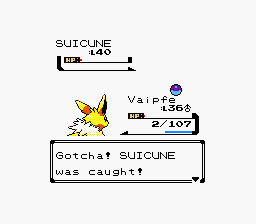 Whether you're reading the fresh descriptions in your Pokédex, using the unique sort function to organize your Pokémon in new ways, watching the all-new battle animations, or discovering another way to capture Suicune, you'll need all of your Poké-skills to master Pokémon Crystal on your Game Boy Color! 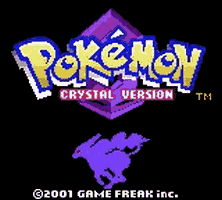 Pokémon Crystal Version, it was only a matter of time before I reviewed this game. I mean it is my favorite from the G/S/C line up, it seemed longer and more completed than Gold and Silver did. Since it is my favorite I had to give it a 10, for me it is pure nostalgia and an amazing game all rolled into one. A lot of people thought of Crystal as it's own game, not part of a line up, and it is easy to see why. Gold and Silver were considered beta versions (for a lack of better words) for Crystal. 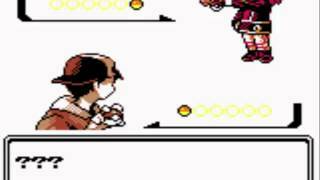 Although everything was almost the same the game felt different to players and avid Pokémon fans everywhere. I'm going to tell you of the slight differences to Gold and Silver that made this game even more enjoyable. What better place to start than from the beginning? As you are going through the usual introduction, meeting the Professor and him discussing what Pokémon are and what kind of adventure you are about to embark on you will notice that he asks, "Are you a boy, or a girl?" This is the first time in any Pokémon game where you got to pick your gender, and now that girls knew they could be a part of the franchise the market for this game sky rocketed. Another major difference in the game was the addition of Battle Tower, now the players can test their skills against high leveled opponents and smarter A.I. 's (aside from the Elite Four and Red). The tower stands on the outside of Olivine City right before you surf out to Cinawood City. Another difference Eusine was added, a man who is obsessed with Suicune and even makes an appearance in the show. And for the final difference, Dragons Den was changed. It had trainers scattered all over the place and once you found the entrance to shrine in the middle you will be quizzed about Pokémon once you answer them Claire will give you the badge and you will also receive a Dratini if you talk to the man who quizzed you, just leave the house and come back. For this game I gave the graphics a 10, there were some differences in the tiles that made the game seem more creative and made the area look more like what it was suppose to be. For instance, the Ice Path. I'm sure everyone remembers the big sheet of ice with the strange dome shaped rocks, well instead of the rocks they were replaced with actual ice pillars. 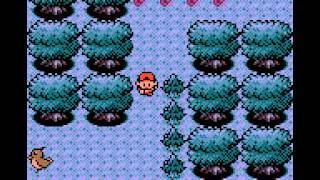 Which added more realistic imagery to the game, it made you actually feel like you were trying to skate across this sheet of ice to get to your next gym battle. Now onto the sound, since there really wasn't a difference in the sounds from all three games I gave this a 9. It's not that I don't like the music of this game, they just don't compare to how Red Blue and Yellow sounded to me. However, whenever I do hear the music from the G/S/C era I will be reminiscing about my childhood and one of my favorite Pokémon games. As for the addictiveness of the game I gave it a 10. I can play Crystal forever, even if I have all the badges and all of the Pokémon. It doesn't matter, I love the game. It is fun to play and can be played over and over again. One of my own addictions in the game is the bug catching contest. This is where you go to the National Park on certain days (just outside of Goldenrod City, before you go to Ecruteak City) and you with a bunch of other trainers go out and catch the strongest bug Pokémon, each one has a point value that the game keeps hidden so you don't cheat. Whoever comes in first gets a Sun Stone, but if you don't come in first you still get wonderful prizes (if I remember correctly the first time I won, I had a Pinsir). I didn't rate the story, because I feel like a lot of the Pokémon handheld games don't exactly have a story since you don't necessarily have to go out and catch them all, or collect all of the gym badges. Some people like to use this game for breeding Pokémon, and collecting Pokémon eggs. Since I don't usually do that the only two I really know how to obtain is Togepi and Igglybuff. But others may know more, and could tell you how to get Smoochum or Elekid or even Magby. For the depth I gave the game a 7, I felt that is was a little longer than Gold and Silver since they added Eusine, the battle tower and the extra trainers at Dragons Den. Even the Kanto region seemed a bit longer, although I can't really explain why. Kanto wasn't exactly changed from Gold and Silver to Crystal, not that I am aware of anyway. But I noticed it the last time I played, I just felt like I was in Kanto for a really long time. As for the difficulty of the game I gave the game a 6. It was just a little harder than Gold and Silver, maybe because it was longer and battle tower once you go up a few floors becomes really challenging and the Elite Four are definitely not easy in fact they are harder than the Elite Four in the Kanto region. In my review of Pokémon Gold Version, I said that Gold had a few new features like the Pokenav and pressing a on a tree to cut it down, well those features were (kind of obviously) transferred over to both Silver and Crystal. I found these added features a lot more convent to game play, the only time I hated the phone was when Mom called, when you see it you know that she had spent your hard earned money on something that was more than likely useless to you at this point. However, she is useful if you want to make as much money as possible in the game since she saves some from every battle you face. This concludes this review, I hope that my words have made you consider this game if you have never played it before and for those who have I hope that they will remember how much this game may have influenced their lives when they were younger and want to play it again. It was truly a wonder game, and I may even play it over again myself now. 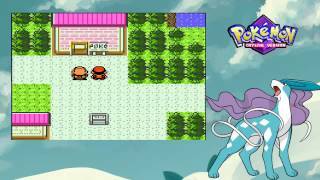 Crystal Blue Persuasion: A Pokemon Crystal Review SteveTheRedPikm.. This is strange, but also permanent, so only do this if you want your clock to remain set on a certain day. To do this, go to Vermillion City and talk to the Machop that is stomping on the ground. After you talk to him, open your Pack, go to Coin Case, and look at how many coins you have. Your game will either freeze or reset, so you must reset if it freezes. When you do, your game clock will be frozen in that exact time unless you use another code to change the time, which is possible. Who's your favorite Johto starter? Is it possible to trade pokemon with other members? A good way not to get frustrated in the game. The Elite 4 is around lvl 50 - 70 including the Champ, if I remember correctly. With a versatile team and good items, you can beat them with Pkmn about lvl 50. What lv should my pkmn be for the elite 4? amazing game. i remember trading pokemon in elementary school on my gameboy advance in elementary school. How do you save on this game? That's how you make a sequel! Awesome Game! ive got poroblems with saving/loading the game. What does it mean to save in the game and then in menu?? My advice- catch one of those Electrode in Team Rocket HQ and teach it Thunder. It destroys things. this game really makes me so nostalgic, since its quite a tradition that the third one in every generation has some unique special events, but also its a version with more detailled graphics, animations, scenario, story, really bringing the best. So I finally got the game to work with RGR, I was wondering if the fixed the pc cloning glitch in crystal since I can't seem to get it to work. Anyone know? @LunarDarkness2 when I try to play it on RGR and go to new game after the opening video it comes up with and I quote : "This game pack is only designed for use on the Game Boy Color." @anime_fan_one What are you talking about? It does work with the RGR plugin. Is there a reason why this game can't be played on the RGR emulator yet it works on the java emulators? I would like to play this game using my pc controller but it wont work with the java emulators. @SuperTeenOne Because it's Pokemon. Nuff' said.